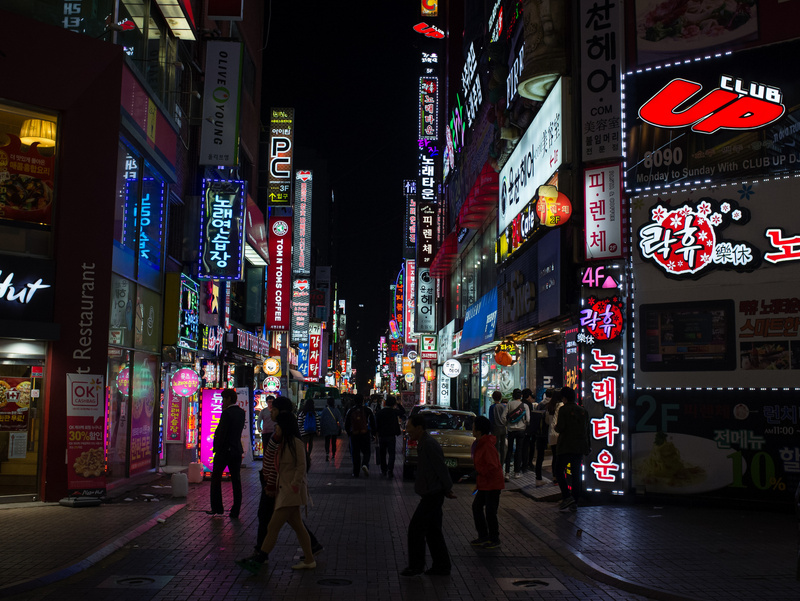 At first glance South Korean cities can seem more than a little homogeneous. The towering apartment buildings that house the majority of the country’s urban population dominate the skylines of every town and city. Most of these blocks were either built in a surge of post-war development in the 1970s and 80s, or seem to have been modelled on the utilitarian style of this period. The majority of other urban dwellers live in boxy, low-rise ‘villa’ apartments, which also seem to have been designed as poster-buildings for the triumph of function over form. Shopping areas seem similarly standardized, with the same chains of local and international coffee shop, bakeries, convenience stores, clothes emporiums, fast food establishments and phone shops appearing at regular intervals. 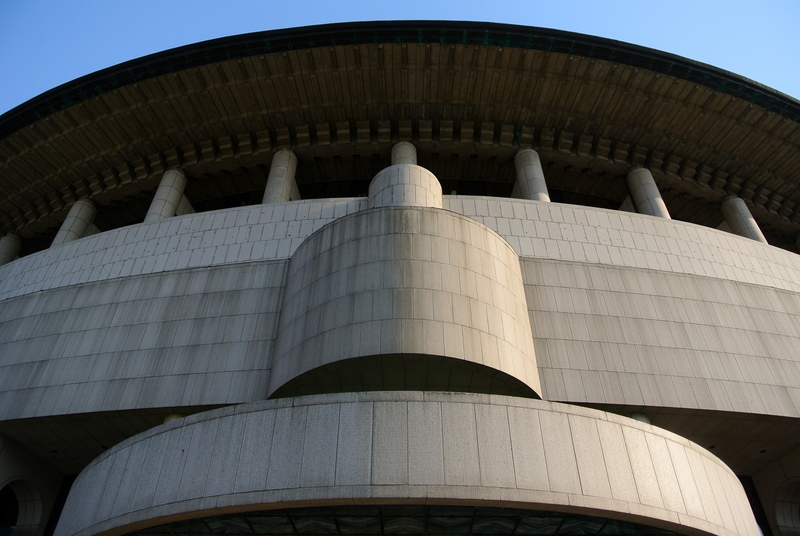 Civic buildings, though often impressive in scale and in the facilities they provide, are similarly standardised, and are almost without exception concrete-clad in the classic monumentally modernist, for-the-people style. Traditional Korean residential architecture, characterised by the ornately-roofed hanok house, is rapidly disappearing, as cities are redeveloped to deal with their increasing populations. 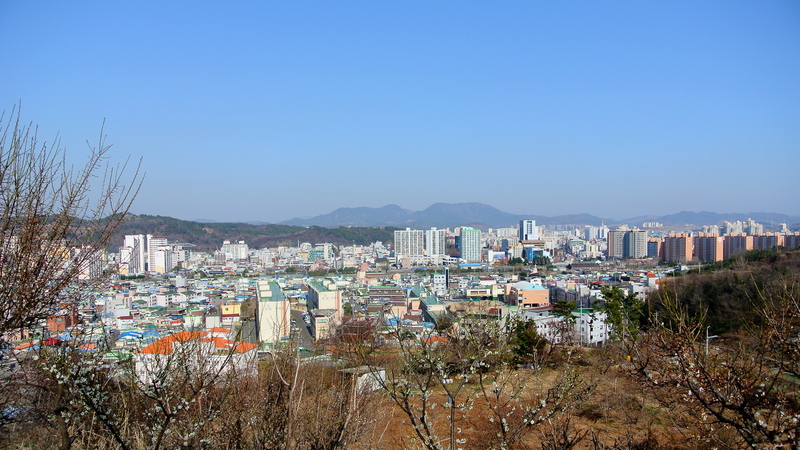 With space already at a premium due to the mountainous nature of the Korean peninsula and the importance of preserving agricultural land, modern urban planning seems to be based on a vertical, cookie-cutter approach, designed to cram an increasing amount of people, shops and services into cities’ diminishing free space. 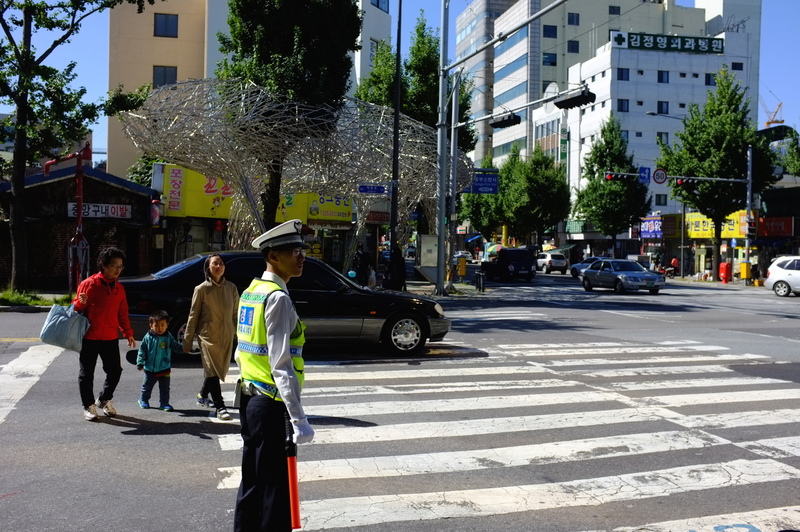 This approach can be highly efficient, with cafés, bars and restaurants – not to mention noraebang and hagwon – piled up on top of each other. It can also lead to a lack of visual individuality, with original architectural designs and stimulating public spaces seemingly thin on the ground. 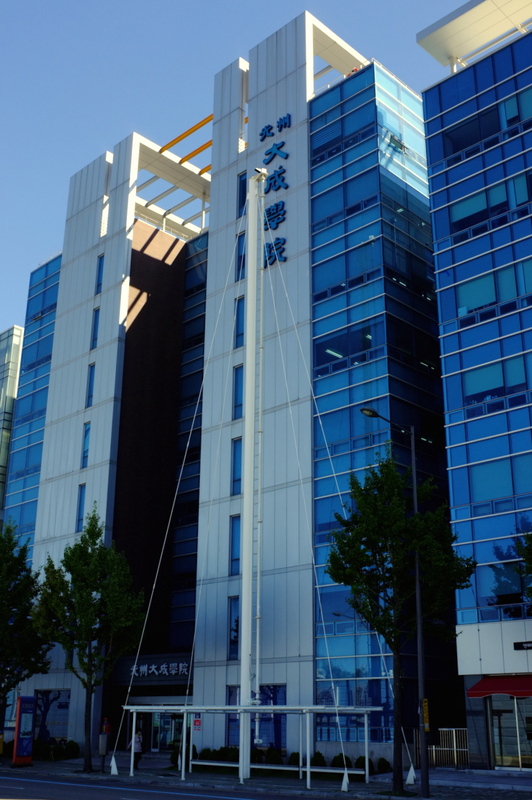 Flashy examples of the former typically only found in major financial centres, and the latter are mostly limited to landmark developments such as Gwanghwamun Plaza in Seoul. All this can lead to the feeling that, outside the capital, there’s little in South Korea to delight the eye or satisfy the urge to seek out unique urban sites. However, take closer look at the country’s provincial cities, and diversity starts to appear in cracks between identically gleaming neon shop fronts and scruffily chaotic narrow back alleys. 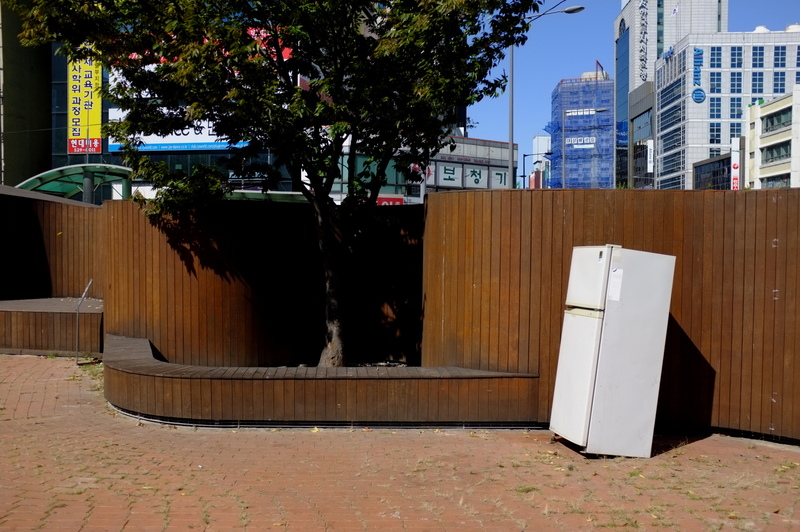 Beyond the bland skylines, Korean cities are home to some wonderfully strange juxtapositions: of new and old, pragmatic and whimsical, filthy and sparkling, rough and smooth. Gwangju (also sometimes romanised as Kwangju), in the south-west of the peninsula, is the sixth most populated city in South Korea. Indelibly etched into the public consciousness by the massacre of over 200 student protesters by government troops on May 18, 1980, the city has developed a reputation as a safe-haven for liberal ideas. It has also become known as a city that celebrates creativity, with a major international art biennale held in even-numbered years. In odd-numbered years the purpose built Biennale Hall becomes home to the Gwangju Design Bienalle, which was the impetus for my visit. The exhibition was beautifully curated, and contained plenty to excite fans of product, interior and industrial design, as well as objet trouvé art. 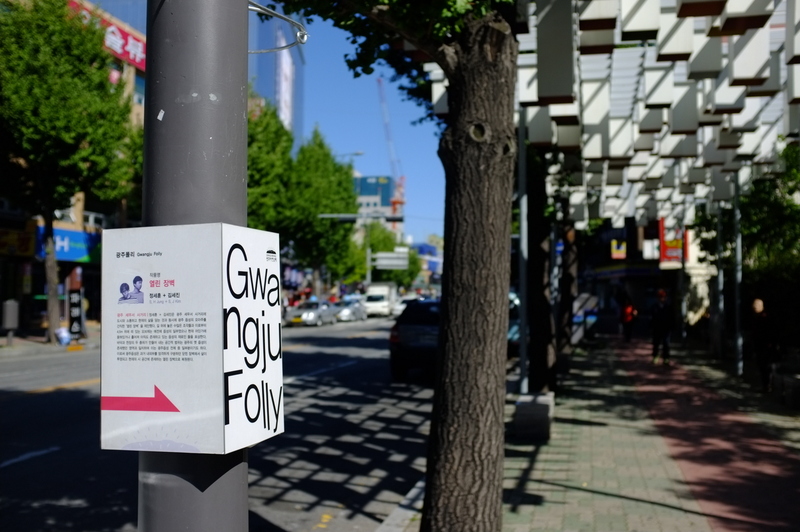 For me, though, the most intriguing part of the exhibition brochure was a somewhat cryptic section hinting at the existence of two Biennale-sponsored projects in the city centre: Gwangju Folly I and II. After making enquiries to several staff members of varying degree of helpfulness, I was presented with a detailed guide to the first project, and instructions on where to find it, which I dutifully resolved to follow the next day. 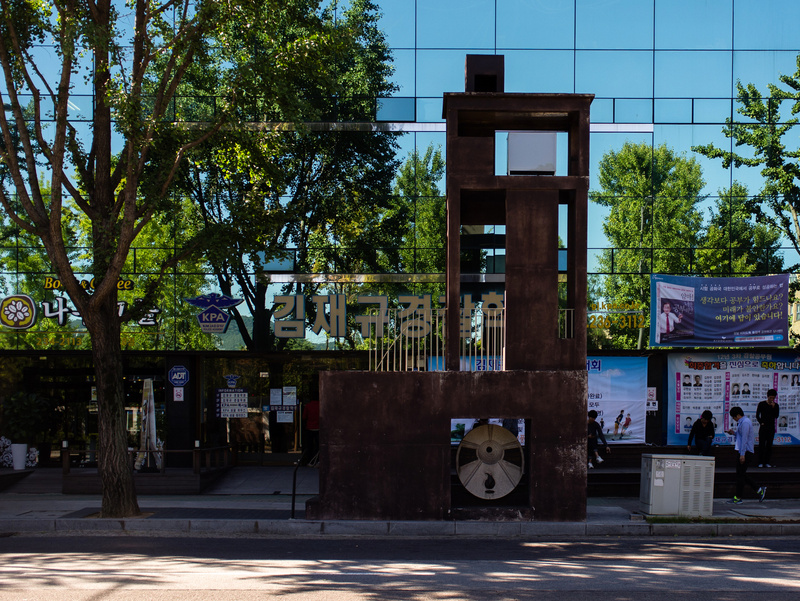 Gwangju Folly I is a collection of 11 architectural objects, installed in a rough loop in central Gwangju as part of the 2011 design biennale. The follies were designed by prestigious architects from Korea, Japan, Europe and the USA, and built along the old path of a now-demolished fortress wall. 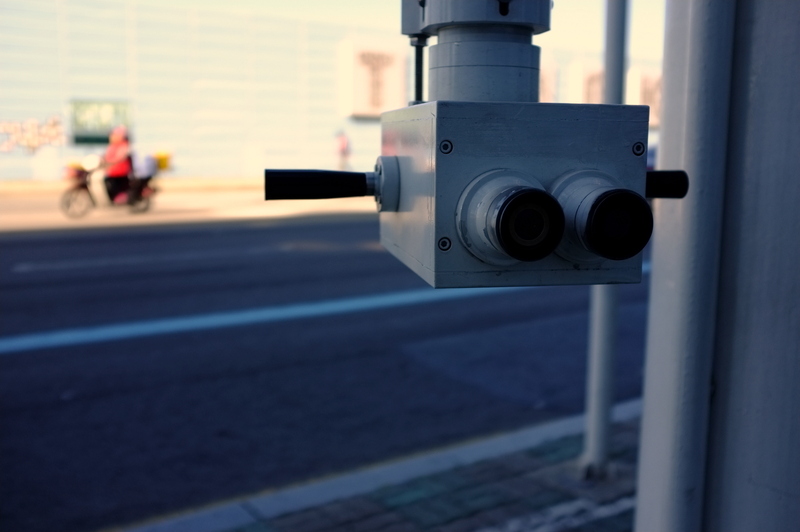 They were designed to be both decorative and functional, to interact with their surroundings, “communicate with the passerby”, and to act as catalysts for urban regeneration. 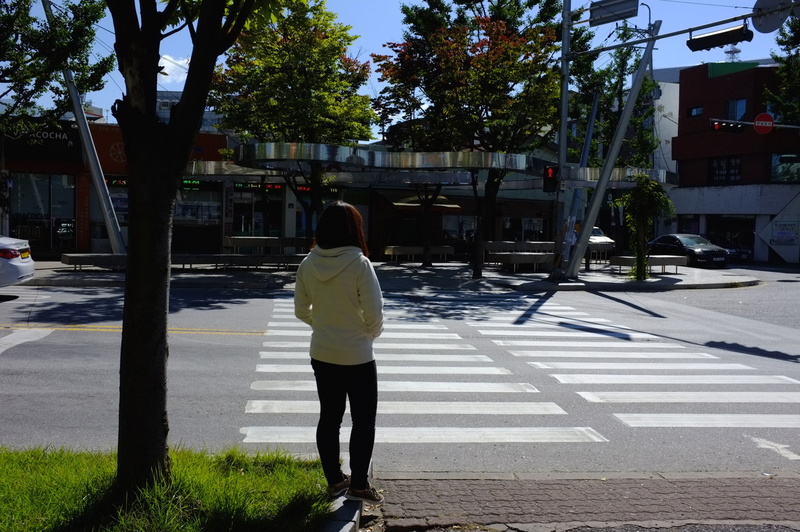 A walk around the follies takes you through a range of Gwangju’s urban environments, and encourages you to examine the city’s past, present and future. I started my tour on an intensely bright morning, not far from the ‘love motel’ I’d spent the night in. More on motels later. The first folly I came to was Public Room, which is reminiscent of a concrete fire escape with the building blasted away. The structure consists of a set of stairs to an enclosed viewing gallery which overlooks the vast construction site of Gwangju’s Asian Culture Complex, which is due to open in 2014. The Culture Complex looks like it will be an ambitious mix of public space, office space and arts facilities. At the time of my visit, though, the colourful, decorated fencing that surrounds the site acted as a handy circumference to the first few follies on my tour. 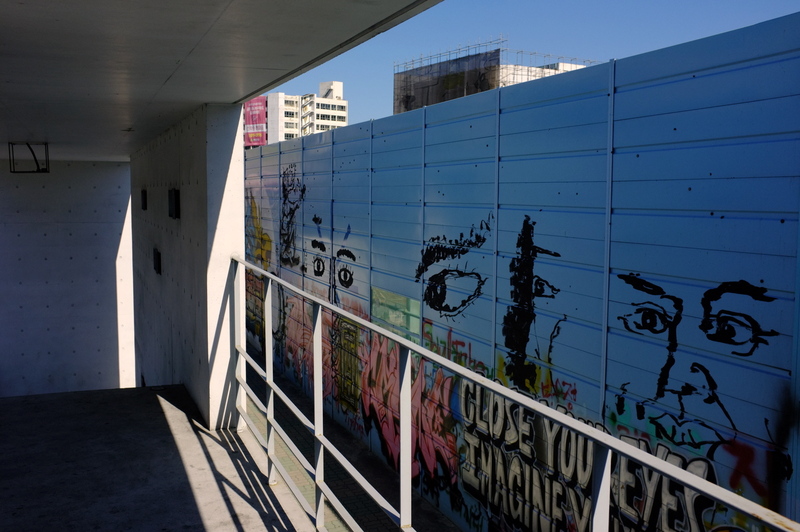 I followed the fence to Periscope Pergoda, a 25-meter tall tower with a periscope mechanism at its base playfully offering pedestrians an aerial view of Culture Complex’s construction, and the city beyond. 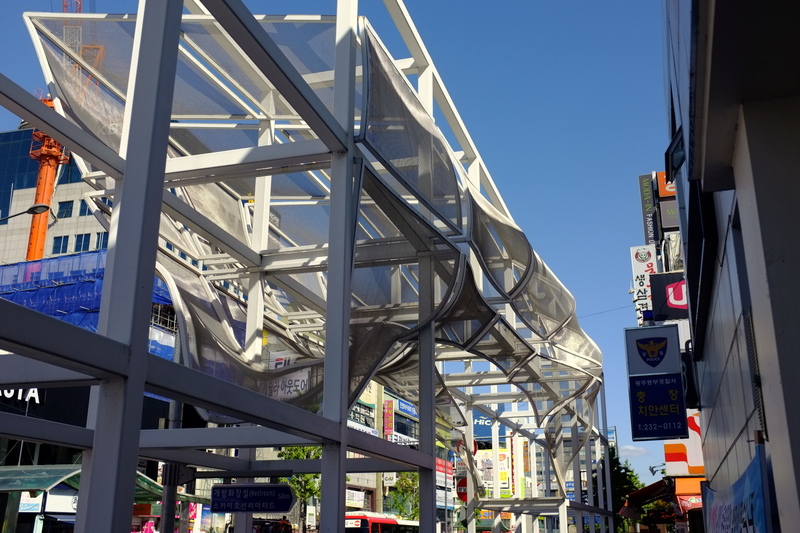 At the far corner of the construction site, I walked beneath the sinuous metallic curves of Communication Hut, which snake around tress and serve as shade and a lighting track for a small public seating area. 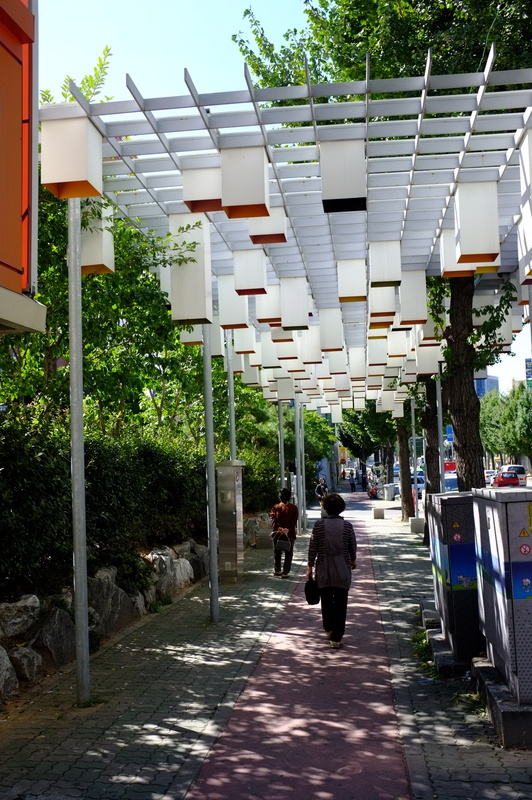 Moving beyond the boundaries of the Culture Centre, I came to Seowonmoon Lantern, which echoes Public Room in presenting pedestrians or potential bus passengers with a set of stairs up to a small viewing gallery. 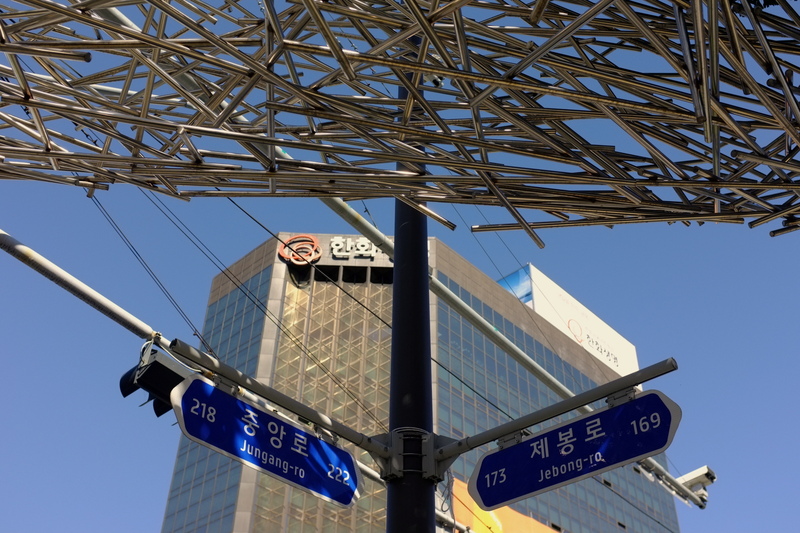 The platform offers views of a busy tree-lined road to the west, and the viewer’s reflection framed by colourful hangul lettering on a shiny mirrored-glass building to the east. The carved memorial stone slotted into the tower’s base was the only part of any of the installations I saw which directly referenced the 1980 massacre, although echoes of it can be felt in many of the textures and shapes of the other follies. 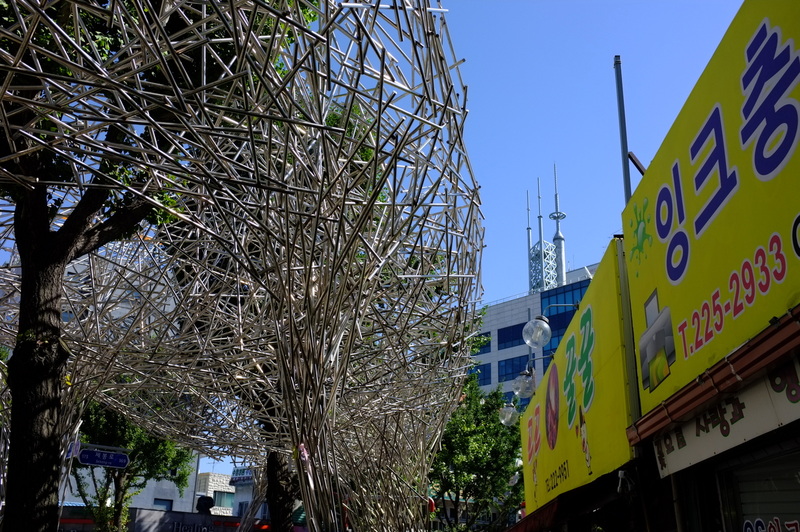 For example, the roiling mass of twisted metal tubes that makes up Gwangju Swarms, my next step on the tour, could easily be interpreted as a depiction of the frenzied bundle of a violent protest. 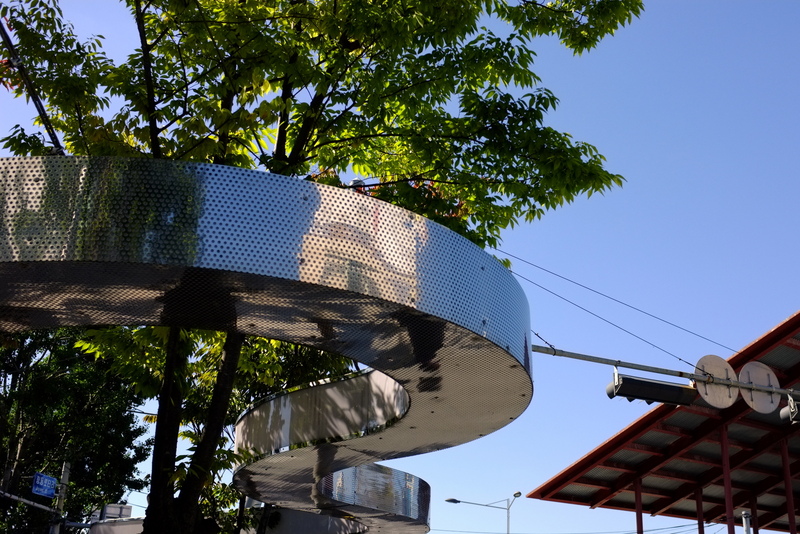 The structure also has a raw, elegant beauty, wrapping itself around trees, swooping around shop fronts and casting intricate shadows on people passing between its tapering pillars. 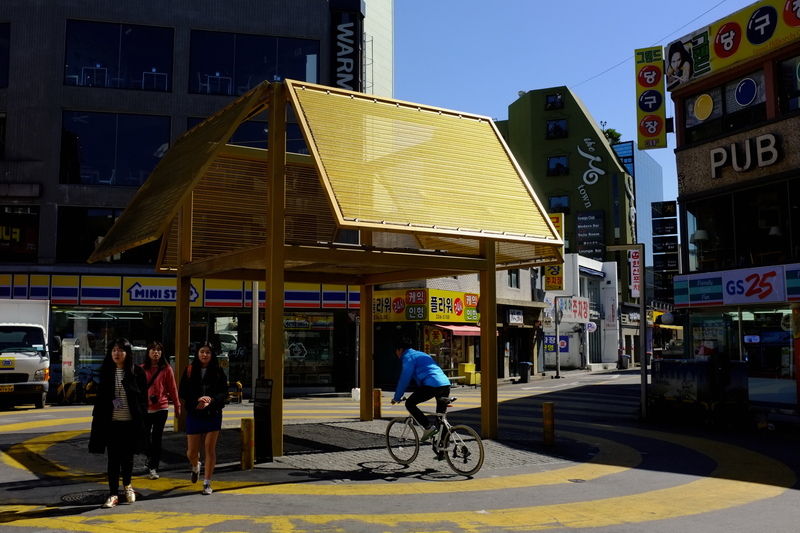 Consisting of a winding wooden wall along one side of a small urban park, Flow Control acts as a buffer between a noisy intersection and a peaceful area of pedestrian space. A little further down the road, 99 Kan marks the former position of an ornate gate in the demolished fortress wall with a stark blend of boxes and curves in white-painted metal and wire mesh. This structure feels at once brutally modern and strangely dated – perhaps because it reminded me of the entrances to many 80s- and 90s-built English shopping centres. 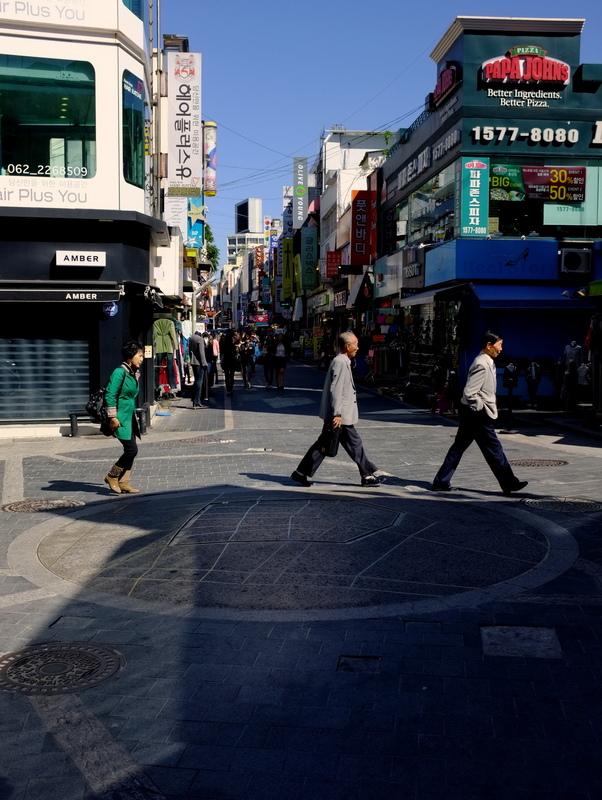 Korean cities are mostly free of western-style shopping malls, although many have streets full of boutiques, bars, clubs and cafés which have recently been pedestrianized, at least in theory – plenty of cars are in evidence, and scooterized delivery people seem to have right-of-way everywhere in Korea. 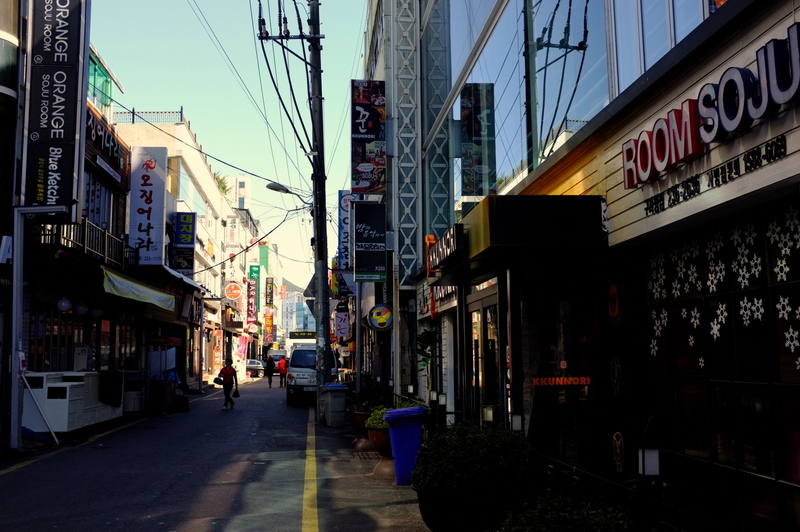 Gwangju has some of the largest and most vibrant of these zones, and the remainder of the follies on my tour were located in one such tangle of streets. Open Wall sits at the edge of the downtown area, and with its scattered roof of cuboid shapes evocative of traditional lanterns, ancient building blocks and an upside-down modern cityscape, seems to suggest a gateway between different time periods. On one side of the structure, adjuma hawk vegetables from roadside containers; on the other, Frappuccino-sipping students browse for vintage clothes. Passing into the downtown area of the city, the architecture starts to become a little more adventurous. 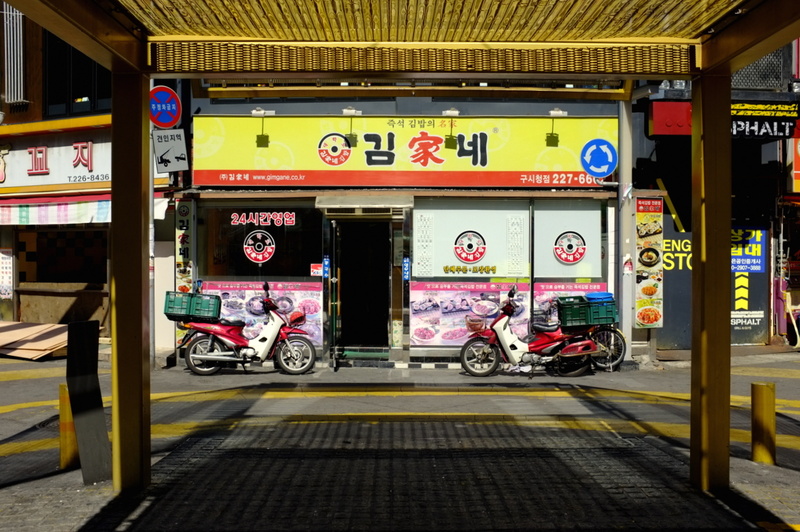 Much of the more outré styling can be found in the exteriors of the love motels, which are ubiquitous in Korean cities. Motels are frequented by amorous young adults, business people meeting non-spouses for illicit encounters, and by travellers looking for a convenient, gaudily-decorated room at an often pretty reasonable price. 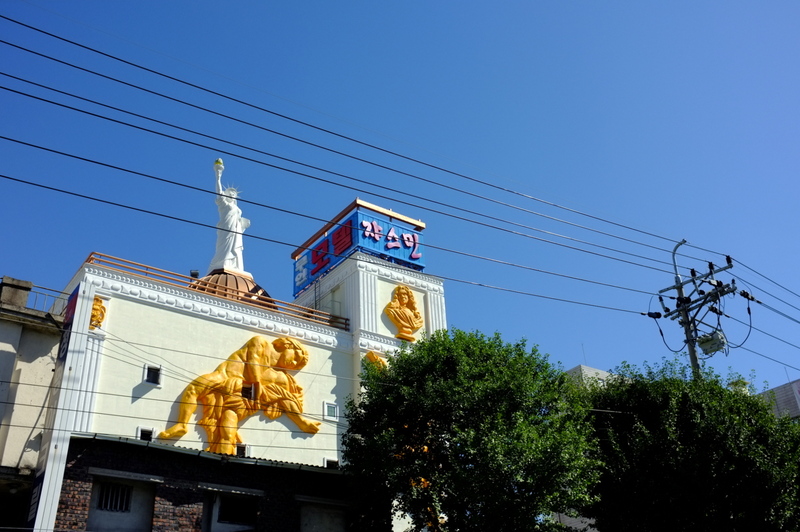 To help motels stand out in a crowded market, their façades are often just as extravagantly decorated as their rooms, often suggesting a theme or acting as a pastiche of a time period or architectural style. 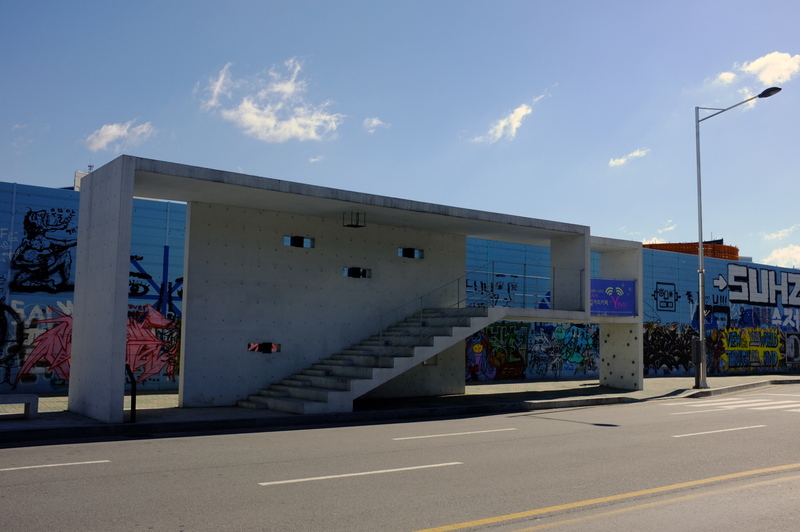 Gwangju features some excellent examples of this trend, which contrast nicely with the distressed of the more run-down parts of the city, and the hipster cool of the downtown area. Far less ostentatious is the next folly I spotted, Threshold for Intimate Recollections. Easily overlooked, this understated piece consists of a shallow mound in the middle of a junction in the pedestrianized zone, in-laid with an outline map of the old fortress walls. 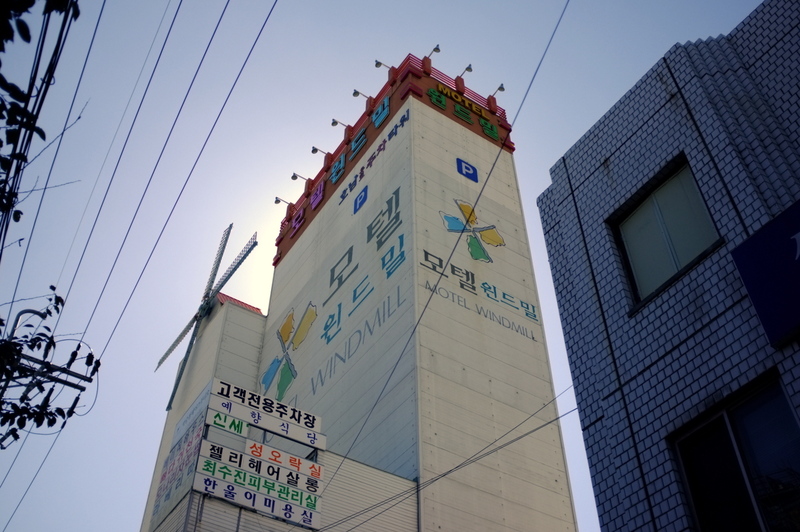 I only had a few hours to do the tour, so feel like I only really scratched the surface of Gwangju’s modern follies. I missed one Folly I installation located away from the main loop, and didn’t even begin tackling the structures that make up Folly II, which were installed more recently. 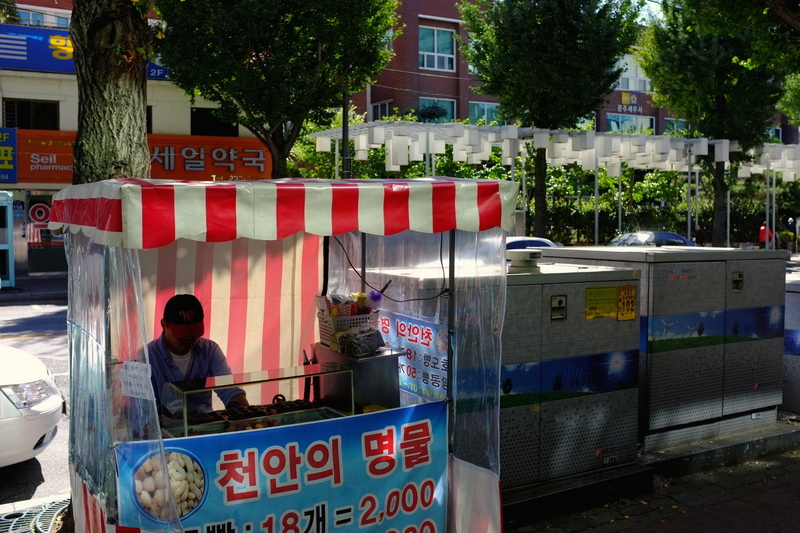 Even on such a tight schedule, though, touring the follies gave me a sometimes surprising, occasionally awkward, often delightful way to look around the corners of a vibrant Korean city. Well worth a few hours of any urban explorer’s time. 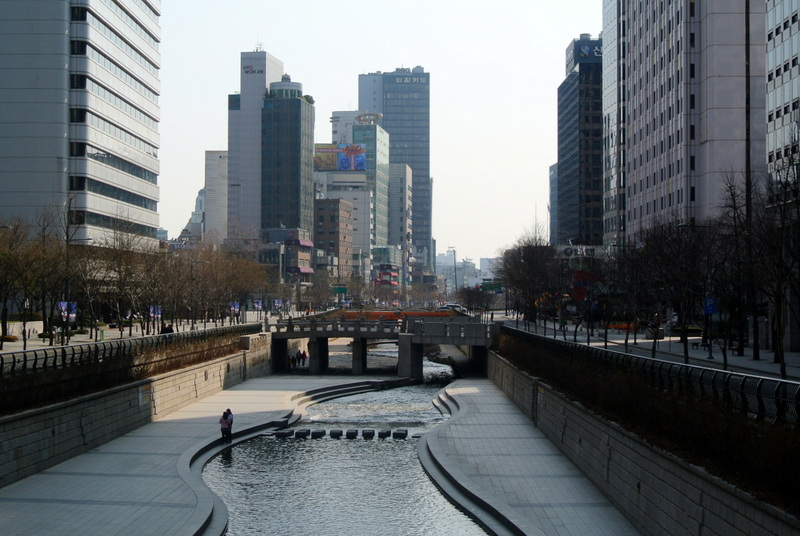 Ben is currently working in Jinju, South Korea. More words and pictures can be found at The Light Through the Window.